Are you living the active life you envision for yourself? Maybe itâ&#x20AC;&#x2122;s time to call West Georgia Health, the only accredited center in the region offering four weight loss surgery options: gastric sleeve, gastric bypass, gastric band and banding revision. Our experienced weight loss surgeons and staff are with you every step along the journey; from educational seminars to nutrition counseling, and weight loss support groups to help ensure a lifetime of proven success. As an accredited center, West Georgia Healthâ&#x20AC;&#x2122;s bariatric surgery procedures are covered by many insurance plans. Reach out today for a healthier tomorrow. 16 | Be Hard. Be Strong. Be Ready. This publication is produced by the LaGrangeTroup County Chamber of Commerce. Reproduction in whole or part of this publication without express written permission is prohibited. All claims, materials and photos furnished or used are, to the publisher's knowledge, true and correct. Publication of any article or advertisement is not an endorsement by the LaGrange-Troup County Chamber of Commerce. Gayle Devereaux, Hogansville Business Council Blue Train Books Joanne Mabrey, West Point Business Council Kia Motors Manufacturing Georgia, Inc.
On the Cover Local entrepreneur Harvey Thornton owns Ashley's Diner on Union Street and Teaching, Loving, Caring, Learning Daycare on Depot Street. He is also a champion beagle trainer, shown checking the stance of his American Rabbit Hound Association Hall of Famer Shiloh's White Sox. Banking products are provided by Synovus Bank, Member FDIC. Divisions of Synovus Bank operate under multiple trade names across the Southeast. 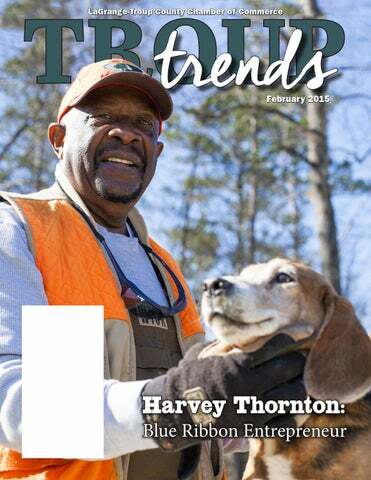 ocal business owner and champion beagle trainer Harvey Thornton splits his time between being the entrepreneur behind Ashley's Diner and Teaching, Loving, Caring, Learning Daycare; being the father of two daughters and three stepsons, and training 22 dogs to properly hunt rabbits. He has won most every trophy there is to be won in the American Rabbit Hound Association for progressive pack, and he has no plans of stopping. He has more dogs to train, more trophies to win and more customers to serve. "Itâ&#x20AC;&#x2122;s how much you want to put into anything. You have to work hard at it and be mindful of your environment." Cover Story Top left, Thornton meets with two patrons at Ashley's Diner; bottom left, Thornton's collection of trophies in his shed, and below, Thornton walks the woods with one of his beagles. Trey Wood is the Director of Communications for the Chamber and serves to provide print and online support to members. Reach him at trey@lagrangechamber.com. MOVERS, SHAKERS, RISK-TAKERS honored 381 hospitals across the nation by measuring patient safety outcomes in 14 areas. Vernon Woods Retirement Community was recently recognized by Grace Management Inc. for the highest customer satisfaction scores for 2014. Residents and family members were surveyed in areas based on assisted living service and quality. Receiving the award were Vernon Woods Wellness Department associates Chasity Boyd, Cindy Cook, Cheryl Messer, Theresa Harper, Shelley Haynes, Jan Phipps and Shanna Hill. DanRic Homes was awarded the Builder of Choice™ award for demonstrating excellence in managing their trade and supplier relationships. To receive the award, builders needed to reach an average score on the trade contractor feedback surveys of at least 90 percent across 68 criteria that have been sub-divided into 10 categories based on their trade and supplier relationships across all levels of their organization. West Georgia Technical College named Ashley Wilson, a Radiologic Technology student on the LaGrange Campus, as its 2015 Georgia Occupational Award of Leadership winner and LaGrange Campus Biology instructor Dr. David Wortham as its Rick Perkins Award winner. GOAL is a statewide program of the Technical College System of Georgia which honors excellence in academics and leadership among the state’s technical college students. The Rick Perkins Award is designed to recognize and honor technical college instructors who make significant contributions to technical education through innovation and leadership. Amber Bullard and Judy Thomason joined Coldwell Banker Spinks Brown Durand Realtors realtors' team. Curves of LaGrange welcomed trainer Kay Scarbrough to their group. Tracy Gynther, RN, BSN, has been named West Georgia Health’s Director of Nursing. In her new position, she is responsible for the administrative leadership and oversight of all nursing care services, which includes coordinating patient care services and programs. Providing Residents with: • Family Self Sufficiency • After School Care with the West Georgia STAR Program • Affordable Housing The Housing Authority of the City of LaGrange, Georgia has been providing income based housing for Troup County and the surrounding area since 1953. Led by our Executive Director, ZsaZsa Heard, we are focused on providing safe, sustainable housing for families in need. We are accepting applications Monday through Thursday. surrendered to Grant seven days prior. Fort Tyler was the last Confederate fort captured by the Union, giving it the distinction, "Last Fort to Fall." March 27-31 – 2015 Georgia Bass Federation Top-Six State Championship More than 300 top anglers from around the state of Georgia will assemble at Pyne Road Park in pursuit of the state championship. April 18 – Rod Benders 10th Annual Homecoming Bass Tournament Nearly 200 fishermen are expected for this annual one-day tournament on West Point Lake. Organized by Rod Benders Bass Club of Atlanta Inc., this tournament is part of the club’s effort to stimulate public awareness of bass fishing as a major sport. LaGrange-Troup County Director of Tourism Dave Marler is determined to make Troup County a top travel destination in Georgia. Reach him at dave@lagrangechamber.com. Learn more about the last week of Jesus’ ministry in one of the most authentic settings this side of Israel. Reservations required. Consider adding a Biblical meal to your tour. order to negate your upcoming liability, especially if you know that the equipment will eventually be needed to help increase operating efficiency and increase your production outputs. Other examples include selling off some loss stocks at year end in order to offset other gains you may have had, or accelerating deductions and deferring gains wherever possible in order to control your tax brackets from year to year. However, trying to save just a little more in taxes by merely spending money or buying deductions at the end of the year – actions you would not normally take – is not sound tax or financial planning. Spending a dollar just to keep from paying a 35-cent tax bill is not a good approach when you could have just paid the bill and kept 65 cents in your pocket. Remember, tax planning is extremely important, especially in today's world of a la carte taxes, but it is just one piece of the financial puzzle. If you have a chance to make money, take advantage of it, and by all means, try and minimize the tax burden wherever possible. But don’t let taxes be the only branch in the decision tree hindering you from executing a good financial plan. Always remember, in the world of tax and financial planning, it is always better to be proactive versus reactive. So don’t be afraid to seek advice before you make a financial decision as the results are sometimes not always what they seem. Grey Bell is a CPA and manager of J.K. Boatwright & Co. He specializes in tax planning and return preparation for corporations and individuals. Reach him at grey.bell@boatwrightcpa.com. Frustrated with your software? We offer solutions! Software Made Simple Inc. is a locally owned software training and consulting company servicing a wide variety of businesses both large and small since 1997. What we offer:  Software Training and Support (Microsoft Office, QuickBooks and many others)  Database Design and Development  Custom Report Writing (Crystal Reports, Active Reports, SSRS)  QuickBooks Installation, Training and Support. Call us today to see how Software Made Simple can increase your company’s productivity! times where we will question where the humanity is in this situation. Be strong in those times. Be strong emotionally, be strong physically, be strong in your faith. “Be strong!” And finally, be ready. As we know, there is tendency to think that each day will proceed like the one before it, that those we encounter in our daily life will respond to us as we would respond to them. With each new week, there is a news report of violence, the overwhelming challenges that mother nature can bring and the unexpected turns that the future holds. Whether it is the eighth time you have had to close up your shop late, to the third call from an irate customer, to weather reports streaming in about the upcoming cold front approaching, be ready. We never know when that one instance will be the one where we are called on to make a split-second, life or death decision. “Be ready!” Some years back, my wife and I traveled to Kentucky up I-75. There is a small town just south of Lexington by the name of Corbin. We detoured to a side road, 25 West, which used to be the major thoroughfare prior to the interstate system being built, and located a small restaurant there. I am reminded of this quote, written by someone who, at the magical age of 65, had an idea for a business and developed a successful, profitable company. It is titled, “The Easy Way.” “It is comparatively easy to prosper by trickery, the violation of confidence, oppression of the weak, sharp practices, cutting corners – all of those methods that we are so quick to attribute and condone as business shrewdness. It is difficult to prosper by the keeping of promises, the deliverance of value in goods, in services and in deeds – and in the meeting of so called shrewdness with sound might and good ethics." "The easy way is efficacious and speedy – the hard way arduous and long. But, as the clock ticks, the easy way becomes harder and the hard way becomes easier. And as the calendar records the years, it becomes increasingly evident that the easy way rests hazardously upon shifting sands whereas the hard way builds solidly a foundation of confidence that cannot be swept away." "Thus we builded.” This was copied from a plaque placed at the original site in Corbin of the first Sanders Courts and Café, later Kentucky Fried Chicken, penned by Colonel Sanders. As we move into this new year, let us be reminded of the lessons learned by those before us: To be hard in our integrity in the face of uncertainty and danger; to be strong in our physical bodies, our mental and emotional being, and in our faith, and to be ready for the unexpected challenges and opportunities we may face. It has been said that, "Success happens when opportunity and preparedness meet." We can never be sure what is just around the next corner. Let's resolve to be ready. Mark Lupo has been with the University of Georgia Small Business Development Center in Columbus since 2005. Reach him at mlupo@georgiasbdc.org. Downtown LaGrange Development Authority invites you to discover Splash in Downtown LaGrange Meet Cathy and Sandy Winslow and Splash’s award winning design team. When it comes to Kitchen and Bath design, they are among West Georgia’s best. Stroll into their showroom in the historic Coca-Cola building on Broad Street to inspire your imagination, whether you need an accessory for the home or to create the kitchen or bath of your dreams. Splash honors Downtown LaGrange gift certificates too. DLDA gift certificates can be purchased Monday-Friday, 9 a.m. to 4 p.m. at the DLDA office, 200 Main St., Suite 1 B. Visit Splash Monday, Wednesday and Friday, 9 a.m. to 5 p.m. Tuesday and Thursday, 9 to 6. Saturday, 10 to 4. The purpose of the LaGrange-Troup County Chamber of Commerce is to facilitate community leadership to create economic prosperity. There’s never been a more exciting time to live and do business in west central Georgia. Business and community leaders are working together to create momentum and spread the message that LaGrange, Hogansville and West Point are on the rise. The LaGrange-Troup County Chamber is the leading business advocate in west central Georgia. Our members represent some of the region’s most important and influential entrepreneurs, corporate leaders, small business owners, young professionals, educators and others. As a nationally-accredited five-star chamber with more than 900 dues-paying members, the Chamber keeps one priority at the heart of its operations – meeting and exceeding member expectations. • Advance the Region’s Economy: Promote and enhance a vibrant, diverse and sustainable economy. • Improve the Quality of Life: Foster a high ranking quality of life for residents and visitors. • Enhance Member Success: Provide targeted programs that add value, services, opportunities and recognition for our members • Improve Organizational Capacity: Position the organization and the staff for long term success by operating the chamber with excellence, innovation and efficiency. BELONG The collaborative spirit of our region allows West Central Georgia to thrive economically. The Chamber’s work is made possible by our members, who are driving our region’s future. Through Chamber events, programs and initiatives, our members have grown their businesses, taken leadership roles in the community, mentored each other and helped Troup County grow and prosper. Special thanks to our 2014 corporate sponsors! We welcomed 81 new members in 2014! PROSPER Being a chamber member is about much more than the bottom line of a single company. Together, we are thousands of businesspeople who support our communities by creating jobs, volunteering and fundraising for worthy causes, mentoring our youth and future leaders, and marketing our communities to future businesses and residents. Our strength and success arise from the number and quality of our connections to each other. across the southern and eastern United States, EMS Consultants has a client base of more than 250 ambulance providers. Rather than continuing to do business the way he had for the previous 30 years, Jerry Cleaveland has evolved his business plan for the past three years and reaped business success. With an aggressive marketing and community relations plan, the firm conducts regular SWOT analysis to establish sales goals and benchmark customer service. With the front desk team member serving as CEO of First Impressions, this year’s winner will continue to excel in customer service satisfaction. Beginning in a small building just outside of LaGrange in 1963, Mountville Mills currently maintains more than 640,000 square feet in manufacturing plants and employs more than 600 associates, almost 400 of which are employed in LaGrange. Now global, they operate divisions in China, Belgium and Canada. They are the largest manufacturer of rubber-backed mats in North America. Still a family-owned business, the company has been recognized as the top supplier in their industry and as the State of Georgia’s Family-Owned Business of the Year. Truly a “home grown” company that is creating jobs and future opportunities for our local residents, Mountville Mills also creates opportunities for students through their Internal Management Trainee Program. A relative “newcomer,” locating in Troup County in 2010, Powertech America’s business performance has been stellar. With an over capacity of demand, the company has been able to adapt their production processes to meet that demand and still deliver a quality product on time while creating more than 500 new jobs. They have quietly supported area education and community non-profit organizations through financial and volunteer support, including being one of the first businesses to support the local college and career academy initiative. Their commitment to develop a top quality workforce through individualized staff development plans that recognize each employee through their self-driven skills matrix and career path is impressive. 2015 Outlook and sell hospitality products and furnishings around the world. This recipient epitomizes the term “glocalization”—doing business globally but remaining committee to its local team and community. Jackson Heating and Air is a second generation family-owned business that has introduced new business practices and technologies into a well-established firm. With a 70 percent local market share and sales up 28 percent in 2013, this winner converted fleet vehicles to run on alternative fuels. This conversion saved the company $65,000 last year. Already accomplishing its 5-year business goals established in 2011, this company continues to raise the bar. Moving from the 8th largest product dealer in the state to the 3rd, we’re pleased that this company is named “#1” as our Small Business of the Year winner. In 1991, Coach Kenny Moore began an invitation-only high school tennis tournament with 17 participating teams. Today, over 80 teams from all over the State of Georgia play in the “Granger Invitational.” Annually, the two-day tournament brings more than 1500 people to Troup County. Over the past 23 years, Coach Moore’s efforts have brought thousands of tourists and their spending dollars to the community. The Granger Invitational has grown to become the largest invitation only high school tennis tournament in the State of Georgia. Tourism Service Star Award As an executive with Georgia Power, John Asbell has harnessed the energy of all the power plants in the state and put them in one body—his! He has served on the tourism advisory committee for three years, attending all of the meetings and always advocating for legendary customer service, relationship building and proof of return on investment with tourism dollars. As chairman of the 2013 Bassmaster Elite Series Fishing Tournament, he raised more than $30,000 in sponsorships and led the 30-member volunteer committee to host a tournament that ESPN2 broadcasted to the world. Cliff Meeks of the Georgia Department of Labor was selected the recipient of the 2014 Ida Tarver Jones Volunteer of the Year Award. The Chamber Board created the award in 2013 to remember Mrs. Jones, a servant leader who represented the Chamber throughout Troup County, the nation and the world on her numerous travels. Mrs. Jones’ daughter Traci Jones, sister Annie Greene and brother-in-law Oliver Greene presented the award to Mr. Meeks. their membership. The Otto Korth Diplomat of the Year was created by the Chamber Board this year to honor Korth’s service. The inaugural award was presented to Nancy Sue Laminack, Curves of LaGrange. Established in 2009 in honor of the former Chamber President, the Jane Fryer Award is presented annually to a community leader who has gone the extra mile to get involved in programs that benefit the community and who exemplify the dedication, worth ethic and community service that Jane Fryer showed in her 35 years of service to Troup County through her efforts at the Chamber. Patrick Crews, Troup County Commission Chairman, presented the award by illustrating how Spinks served as a great teacher of life lessons. “He regarded public service as an honor and privilege that should never be tarnished by personal gain,” Crews noted. “In his every action, he showed us that we must always take the high road—doing the right thing for the right reason.” Crews added that Spinks was a consensus builder in the community. “Many times those around the table would only have one thing in common and that was their trust in and respect for Roy.” Chamber Board Chairman Robby Burch echoed Crews’ sentiments by saying that “Roy lived by a very simple motto—to put faith, family, the future or this community first and to do business with unquestioned integrity.” Accepting the award in his memory were Spinks’ wife Tracy Spinks, son Patrick Spinks and daughter Jennifer Upshaw. stood in the middle of the lobby, among 500 other conference-goers, absently checking my phone for new emails. I opened one from a name I didn’t recognize. Just a few sentences into the message, I was back in time – nine years ago – in an interview with a woman I’ve never met, but who had a profound affect on me. By the time I finished reading, I fought back tears and was inspired again. It was 2006 and I wrote for LaGrange Daily News. One story had turned into a series about domestic violence in our community. In this story, I told about "Renee,"
Valerie Williams, a self-described domestic-violence over-comer from Roswell, shares her experience of being shot by her now ex-husband after a domestic dispute during a Harmony House vigil in downtown LaGrange. Photo courtesy of Tyler Jones with the LaGrange Daily News. although that isn’t her name. She had moved from several states away to Georgia with her husband. He had been abusive, but wanted to make a fresh start, he said. So they moved into a house outside the city limits of LaGrange. It wasn’t long before the new beginning wasn’t new at all. He wouldn’t allow her to work, would disable the car when he was gone so she couldn’t leave with the children. He kept her isolated from other people, gave her no access to money. When he tried to kill her, she called 911. With support from Harmony House and others, she was able to take her children and return to her family in another state. When I talked to her in 2006, she was in the raw stages of healing. Her message last week to me was that she had eventually been successful in that healing. It was terrifying, but she was able to testify against her husband and see him go to jail. She and her children took the steps to move past the trauma. Eventually, she found a man who loved her well. first resources for Renee and her children, I knew there were also many hours from volunteers, therapists, church members, schoolteachers and more. It took financial resources to help her land on her feet, find a job, find a way to move back home and begin the long and often exhausting way to healing. People can and do change their lives. Whether it’s moving out of poverty, leaving a destructive relationship, or breaking an addiction, they are able to do it. But not alone. Our community has many nonprofit organizations that offer resources, but they can’t do it alone. They all require volunteer support and financial support. And, sometimes, they need to be reminded that it all can make a difference. Sherri Brown is the Director of Circles of Troup County, a high-impact approach to address poverty, and a certified Bridges Out of Poverty trainer. Contact Sherri at sbrown@troupco.org. From left, District 4 Public Health Director Dr. Olugbenga Obasanjo looks on as coding and billing supervisor Beth Crocker uses the walking desk at the clinic site on Gordon Commercial Drive. The department has made active efforts to increase wellness by moving during work rather than sitting. my desk. At this pace, I am walking at a slow stroll, but at the end of most work days I have walked upward of 6 miles and have taken close to 20,000 steps! I can report so far that the touted effects of walking on mood and sleep are not exaggerated. I am not recommending my walking desk for everyone, but I hope it will encourage recognition of the multiple ways that good health can be achieved, even with the challenges of modern living. Olugbenga O. Obasanjo MD, PhD, MPH, MBA, is the District Health Director for District 4 Public Health. Previously, he served for more than five years on the front lines of public health in Africa. He can be reached at (706) 845-4035. Photo courtesy of Danny Karnik. At top, Georgia Tech freshman and Yellow Jacket defensive end KeShun Freeman. Above, Freeman was named to ESPN's True Freshman All-America Team and USA Today Sport's Freshman All-America team after leading all defensive linemen with 54 tackles, including 37 solo, and leading defense with 9.5 tackles for loss and 4.5 sacks. communicating with his professors, taking advantage of tutoring services and finding helpful students who are quick to help out a member of the USA Today Freshman All-American team. While majoring in business administration, KeShun also is pursuing a pre-health minor with the goal of enrolling in medical school. "I want to be a pediatric anesthesiologist. A few years ago, my little brother had some health issues, and we spent a lot of time at (Children's Healthcare of Atlanta at Egleston). I got to meet many of the doctors and came to admire their work." Not only was KeShun inspired by his brother, he received encouragement from the other young patients. "I realized that if these kids who were very ill could be happy, so can I." Known as one who does his best, whether in the classroom or on the football field, at church or working in the community, KeShun credits his coaches for keeping him grounded while attending Callaway High School. JOB SEEKERS! SURGE STAFFING IS LOOKING FOR YOU! We at SURGE® will partner with you and provide you with an opportunity to work with premier employers in your community. Surge offers a variety of placement options, from temporary to permanent hire. We are sure to have the right match of flexibility for you. King Jr., KeShun is grateful for Dr. King’s leadership. "His work is paying off. It has made it possible for students of different races to attend great schools and work together." He also has strong words for any detractors, saying, "I think it is shameful to be unappreciative of his efforts." He translates his appreciation of Dr. King into his encouragement for others, saying, "I let kids know to not limit themselves, to branch out into other areas of interest. But most importantly, I urge them to fight for what they believe in. I tell them don’t stop, keep reaching for their goals and turn the doubters into supporters." Inspirational words from an impressive young man. For more than 10 years your chamber has sponsored the Youth Leadership Program, producing a generation of future leaders. KeShun Freeman is just one of many outstanding students who will one day be doing memorable work across our community, ensuring Troup County will continue to stand as a beacon of hope and opportunity for all. Casey Rigsby 129 E. Glenn Ave. Auburn, AL 36830 1-800-239-3025 Ext. 4511 Mention this AD and receive three months of FREE Service with the purchase OR lease of a new copier/printer! represents the genius and accomplishment of an individual and his sons. It is a classic tale of the “Great American Success Story.” The story is even more remarkable because they were black men who succeeded in the South, before, during and after the War Between the States. Their selection of LaGrange, where race relations were better than most any other place, North or South, was part of their success, but their own genius, business acumen and productivity helped them break racial barriers in business and society. Honor came to Horace King in his own lifetime with the local press often hailing him as “Prince of Bridge Builders” and “Venerable Architect.” In 1888, LaGrange paid the highest tribute a small town can bestow when it named King Street in memory of Horace and his son Marshal King. One hundred years later, a new bridge on that street was dedicated to Horace and a historical marker placed. In 2004, authors John Lupold and Tom French, Jr. published a biographical history of Horace and his family called Bridging Deep South Rivers. Composer Lee Johnson wrote a symphony in tribute to Horace King with a grant from the National Endowment for the Arts, the latest of many posthumous celebrations of this remarkable man and his family. It received its world premiere with the LaGrange Symphony Orchestra in October 2011, followed by a reception at the Legacy Museum on Main in LaGrange that includes a section on the Kings in its permanent gallery. The Troup County Archives preserves several files and photographs related to the Kings and has published numerous articles on them. Troup County Historian Clark Johnson is a retired Troup County educator with a master's in History. He is the author and co-author of over 17 volumes on Troup County. Reach him at clark@trouparchives.org. arrow play button. Narration is also written at the bottom of the screen; to read more, scroll your finger up and down within the text. To better view the pictures, the text may be reduced by tapping anywhere on the picture. Simply tap the picture again to bring the text box back. At each tour stop, find more pictures by using one finger to swipe from right to left across your screen. The picture also swivels as you tilt your device, showing more of the image. Another neat feature is the map which can be accessed from the home page by tapping the “map” button, or from each stop’s page by tapping the map pin at the top right of the screen. Tapping this icon will immediately take you to the map, displaying where each of the stops are located. To return to the stop’s page, just tap its number on the map. Happy walking! Shannon Gavin Johnson is an archivist with the Troup County Archives. Shannon processes and maintains collections, helps with reference and maintains the archives' web presence. Email at shannon@trouparchives.org. Business Spotlight From left, Striffler-Hamby Mortuary Manager Dwayne Fuller and Office Manager Kathie Suttles. Partners with the Dignity Memorial Network that includes over 1600 funeral homes and more than 500 cemeteries. Being partners in the Dignity Memorial Network enables us to provide services and exclusive benefits to our families anywhere they need them. In 1929, what is now known as Striffler-Hamby Mortuary began as Hammett and Groover Funeral Home in LaGrange. In the mid 1950’s Hudson Maddox bought Hammett and Groover Funeral Home, and the name changed to Maddox Funeral Home. Hudson Maddox operated the funeral home at 118 Church St. until his retirement in 1973, when he sold the business to Joseph E. “Gene” Page and Hudson’s brother, Charles Maddox. The business continued as Maddox-Page until 1986, when Mr. Page sold the business to StrifflerHamby Mortuary from Columbus, GA, and Maddox-Page Funeral Home was relocated to 1010 Mooty Bridge Road. In 1989, the name was changed from Maddox-Page Funeral Home to Striffler-Hamby Mortuary. We handle every detail for our families related to the funeral service/ memorial service of their loved one. We create a seamless meaningful, loving tribute for our families and their loved ones. Memorial funeral home where the family lives can help them with any products and services that we provide here. Being part of a larger group gives us plenty of benefits because we can offer unmatched, exclusive benefits and products to our client families that other funeral homes can’t provide because they don’t have the multitude of resources that we have available to us. Our entire staff consists of local people from LaGrange. We are your neighbors, friends and church family. I graduated from LaGrange High School in 1990. I began serving my two-year funeral/embalming apprenticeship and then went to Gupton-Jones College of Mortuary Science, graduating in 1994. I worked for Hunter-Allen-Myhand Funeral Home from January 1991 to August 1997. I then began working for Striffler-Hamby Mortuary. Striffler-Hamby Mortuary has three locations in LaGrange, Columbus and Phenix City, AL, and I worked at the Columbus location until 2006, commuting daily. I returned to the Striffler-Hamby location in LaGrange in 2006. I have been the manager since January 2015. The team at Striffler-Hamby Mortuary will continue to serve with the best service we can provide and be as active and supportive in the community as we can. Treat every family like a member of our family. Treat them with the utmost integrity and respect, and treat every person like I would want to be treated. lot of time and effort trying to get his facial appearance back as normal as possible. The entire preparation from start to finish took me about five hours. but when I was finished, he looked normal with no disfigurement anywhere. I was personally satisfied with my accomplishment and that I was able to achieve a great lasting memory for the family. But what was most touching to me was when his brother came and asked who did the preparation. I explained to him that I had and was expecting something to be wrong because he was crying, but he went on to thank me with the most heartfelt thanks I have ever received and explained to me that he and his brother were twins – not identical twins but fraternal twins – and he had always wondered what his brother would have looked like had he not been born mentally challenged. Because of the time and effort and care that I took with his brother, I was able to give him the one thing he had always wondered – what his brother would look like had he been born without a disability. This is a personal memory that I keep with me, and I remember it daily to keep me in the mindset that every family, every deceased person, deserves the very best of everything that we have to offer and can provide. The LSPA combines several art forms together, including, at left, ballet and dance; above top, storytelling, and, above bottom, theater and performance. Five on staff, plus countless volunteers. Troup County, West Central Georgia and East Central Alabama. To insure that patrons in the region, and the youth in particular, have the opportunity to enjoy and participate in the performing arts and to insure the arts are alive and well for future generations. Being multi-disciplined, LSPA provides training and artistic expression in live theater, dance and storytelling, giving the community a variety of performing art forms to choose from. has grown to 400 students and the audiences for our live plays have grown more than 300 percent in the past three years. Quality productions and artistic training are the key, along with providing the community with great value for their money and making them want to come back. Help grow LaGrange and Troup County into a region-wide performing arts community that attracts patrons from outside the area as well as within. Have a backup plan for when things don’t go as imagined. Saves a lot of time in trying to regroup after “Murphy” strikes. p.m., Feb. 12-14 and 20-21, and 2:30 p.m. Feb. 15 and 22. Azalea Storytelling Festival, 7 p.m. March 13-15. Beauty and the Beast, 7 p.m. March 13-14 and 2 p.m. March 15. LSPA enjoys many partners on a variety of levels, and every one of them is important to us. 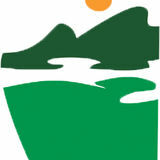 Our partners include our patrons, volunteers, donors, corporate sponsors and foundations that provide us with funding. It is ideally situated and enjoys a community where the value of the arts is passed down from one generation to the next. Just do the right thing. You can’t do more and shouldn’t settle for less. Elementary -school students at West Point CARES have a little fun before beginning lessons. The program began in 2011 and provides after-school and summer programs for local students. Above, top left, program coordinator Monica Barber passes out snacks to students, and, bottom left, volunteer Willie Brooks watches after fourth- and fifth-grade students as they do homework in the Youth Services Center gymnasium. will have only 20,000 books because of the technology that comes with being part of the PINES program.” The Georgia Public Library Service’s PINES program, or Public Information Network for Electronic Services, allows PINES cardholders free access to books and materials available across all 275 libraries and other services in the state, more than 10 million books and materials in total. Books can be delivered free from other libraries and returned to any participating PINES library. Books can also be renewed and have holds placed on them online. “Technology is going to drive this library,” Stankiewicz said. Durand provided ample thanks to many who helped make the library a reality, including Todd, Schuermann, former Hogansville councilman Jack Leidner and Nathan Rall, director of Library Planning and Construction with the Georgia Public Library Service. Library construction is planned to begin in the fall of 2015 with the opening set for the fall of 2016. Left, the new Hogansville library will be part of the state PINES program, Public Information Network for Electronic Services, allowing cardholders access to free books across 275 libraries, and, at right, the library will be attached to B.C. Granger Memorial Park and will include the playground located on the property. HYPE – Helping Young Professionals Engage HYPE is a high impact group of diverse young professionals working together to showcase Troup County as a unique and fun place to work and live. HYPE provides its members with opportunities for building relationships with community and business leaders and cultivates an atmosphere for building personal relationships and a sense of purpose within the community. How long have you lived in Troup County? I was born in LaGrange. Other than a few years in elementary school, I've lived here my entire life. •Upcoming Events• HYPE Annual Kick-off Meeting Join the HYPE Board of Directors for food, beverages and a load of fun inside Legends Tavern at the Lafayette Garden Inn at 1513 Lafayette Parkway. HYPE provides its members with opportunities to network, learn, volunteer and mingle while gaining the many benefits of connecting with the community. Learn how you can get involved in HYPE for 2015, gaining tips and tricks along the way! Where did you live previously? I lived in Irmo, SC, briefly. What is your profession? I own 2BigFeet.com, an online retailer of large size shoes for men. I also write, speak and consult on e-commerce and online marketing. What are your hobbies? I love cooking, and I love to travel. What is your favorite way to spend a Saturday? I don't care as long as I'm spending time with family and friends! Photo courtesy of Tyler Jones with the LaGrange Daily News. Describe yourself in 3 words. Entrepreneurial, ambitious and honest. Young Professionals Chat Young professionals from across Troup County joined speaker and facilitator Bill Graham for a Young Professionals Chat on Jan. 21, discussing ideas that can make the community more attractice to young professionals. If you had $1,000 to give away, how would you do it? I would give it to Circles of Troup County, a local organization that helps people work their way out of poverty. Christmas Tacky Sweater Party HYPE's young professionals brought out their tackiest Christmas sweaters possible to watch the annual LaGrange Christmas Parade from Del’avant’s rooftop on Dec. 4. 4. Ask yourself what you do well. Do you have exceptional leadership skills? Are you organized and detailoriented? Do you like to multi-task? Do you prefer to work by yourself or as part of a team? Before you can reinvent yourself, you have to know who you currently are. "People need to understand their strengths, their weaknesses, their passions, and their own story," said Robert Steven Kaplan, a Harvard Business School dean and the author of What You're Really Meant to Do. "Then they can look at what's going on in the world and try to match themselves up to opportunities." 5. Set real goals, take real action. As you're planning your reinvention, be as realistic as possible. You don't want to be overly optimistic in the inital phase, because you might pick the wrong goal. If you can take specific, practical actions to reach your goal, you're in good shape. If it will require winning the lottery or overcoming challenges like health or geography, think twice. You may want to test drive your new career choice before jumping in head first. 6. Expect setbacks. When you reinvent yourself, you may have to downshift in the short term – maybe taking a pay cut in a new field or having to take on additional projects to prove yourself. Don’t stress out: if you’re moving in the direction you want to go, it’ll pay off in the long term. To stay positive and motivated, seek ways to track your accomplishments as you go. Studies have shown that if you write down a goal, you're more likely to achieve it. 7. Continue to re-evaluate and reassess. The dreams you have today may no longer be your goals two, three or five years from now. Even if they are, the progress you're making toward them today may not satisfy you in the future. Plus the skill set you have today may not be in demand in the future. Continue to learn and be relevant, and take stock of your reinvention progress every year. Reinventing yourself could mean an overhaul in what you believe and how you currently do your job. If you’re up for that, then right here, right now, you can start. Your reinvention will likely require creating new positive and constructive habits to take you out of those routines you've been following for years. But when you break down a reinvention plan into actions you can do every day, you're more likely to integrate long-term goals into your present. If you don't work on them a little bit every few days, you're probably going to lose them. Reinventing yourself might not be easy – but in the end, it will be well worth it to move on in your career to something you’re more passionate about. Renae Willis is the Vice President of Business Development & Marketing at the Chamber. She is a longtime education advocate and former chairman of the Chamber board. Reach her at renae@lagrangechamber.com. Now building in five new home communities in Troup County! Choose from homes ranging in size from modest to magnificent! Visit our website to view all of our available homes for sale! *Buyers subject to credit approval and lending guidelines. 100% Financing available for qualified buyers through USDA Rural Development Program. All information herein subject to error, omission and/or change without notice. Equal housing opportunity. Listings held by Coldwell Banker Spinks Brown Durand Realtors 706-884-5681. Locally owned and operated! Open Monday-Saturday, 8:30 a.m. to 6 p.m. (706) 884-2566•307 Vernon St.
We wash cars at 20 degrees and above! Chamber wanted to commemorate Mansour's and the Mansour family. It’s vital to have this permanent reminder of how important the department store was to the residents of Troup County and to give everyone the opportunity to remember Mansour's in their own way.” Mrs. Evelyn Mansour, shown with the ornament and iconic Mansour's shopping bag, was humbled by the honor. “We have always loved LaGrange and are very thankful for the generations of families who demonstrated their trust by shopping in our store,” Mansour said. Health Checks Womenâ&#x20AC;&#x2122;s Health Senior Companions Foster Grandparents Vital Records Health Education Environmental Health Emergency Preparedness and much more! Advancing the possibilities. Closer to home. WITH CONVENIENT LOCATIONS THROUGHOUT TROUP COUNTY, THE EMORY AT LAGRANGE PHYSICIANS ARE COMMITTED TO PROVIDING OUR PATIENTS WITH THE QUALITY HEALTH CARE THEY EXPECT AND DESERVE.